This beautiful 2002 Chevrolet Camaro Convertible is a fantastic locally owned example with only 17,837 original miles. It has been extremely well cared for and arrives in very good condition inside and out. 2002 was the 35th anniversary of the Camaro and was slated to be the final year of production for this celebrated muscle car. 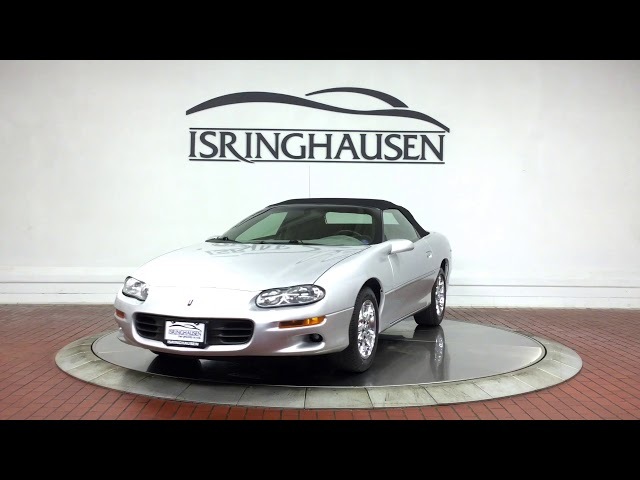 This vehicle not only commemorates one of the greatest American sports cars ever made, it gives you a low mileage, reliable, top down enjoyment at an exceptional value. To learn more about acquiring this special vehicle, please contact a Pre-Owned sales specialist today by calling 877-362-9715. Isringhausen Imports is Central Illinois' premier new car, used car and certified pre-owned (CPO) dealership for quality BMW, Porsche, Volvo and Mercedes-Benz vehicles. At Isringhausen Imports, we have become a leader in the industry by working each day towards the greater good of our customers, our fellow employees, and our community.